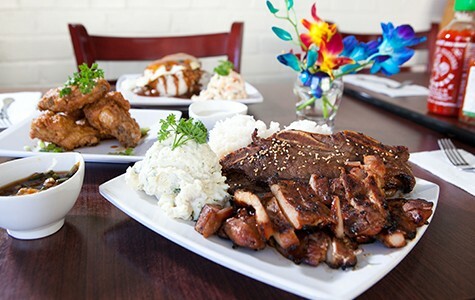 The Hawaiian plate-lunch restaurant serves up island-style comfort food with a large helping of family charm. The tastiest offerings at Kau Kau Corner are the barbecued meats and fried chicken wings. Hours: Mon.-Sat. 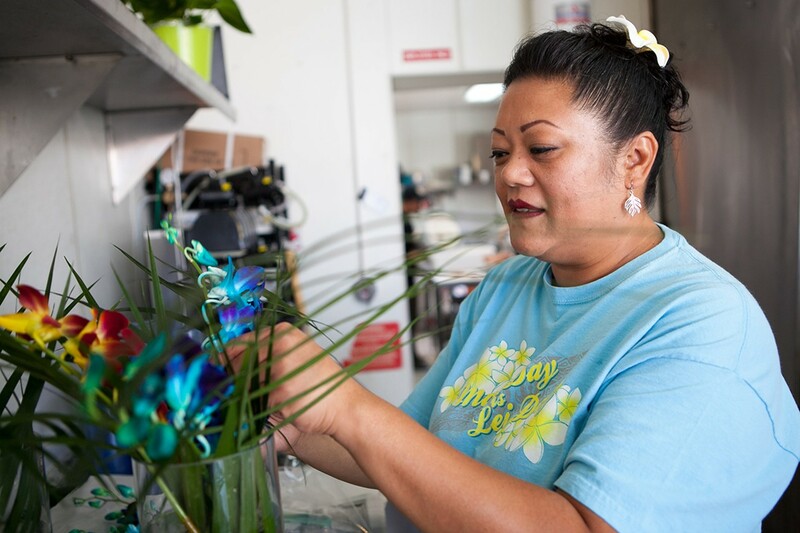 11 a.m.-10 p.m., Sundays 11 a.m.-9 p.m.
For a Hawaiian islander, Alameda is the closest thing to home that the East Bay has to offer — at least in terms of landscape. Now, that's becoming true food-wise as well. Kau Kau Corner, a Hawaiian food popup that has been a staple at the West End Flea Market at the College of Alameda for the past few years, recently opened a brick-and-mortar home on Park Street (1635 Park St., Alameda). The culinary intention is not only to offer delicious kau kau — the Hawaiian word for grub — but to do so with ultimate comfort, which means both as much gravy as you want and the feel of a family get-together. For owners Anthony and Tina Otenbriet, food and family are inseparable. So when they started cooking professionally, their idea was that they would treat customers as if they had invited them over for dinner or a backyard BBQ. And that is largely how Kau Kau Corner feels. During my visit, the bosses walked in, but rather than stiffing up, the waiters and cooks — who were all incredibly friendly — let out a round of welcomes that were each met with a kiss on the cheek. After all, every person involved in the operation is literally a member of immediate or extended family. In terms of presentation, though, the restaurant looks like a typical, casual spot to pick up a plate lunch — the kind that locals frequent in Hawaii. (Thankfully, there are no tacky tiki decorations.) In Hawaii, the mysteriously vague term "plate lunch" refers to a meal (which can also be enjoyed as dinner) that includes macaroni salad, rice, and some sort of barbecued or smoked meat — although some elaborate version can include a handful of other add-ons. While outside of the state the style of dish is often deemed "Hawaiian," plate lunches and the restaurants that serve them actually often represent an eclectic melting pot of cooking cultures, including Hawaiian, Filipino, Japanese, Korean, and Chinese. Plate lunches are the focal point of the Kau Kau menu — although they are presented under the less redundant title "Aloha Plates." Diners can also choose to order potato salad instead of macaroni and brown rice instead of white — options that are likely meant to accommodate Bay Area costumers. 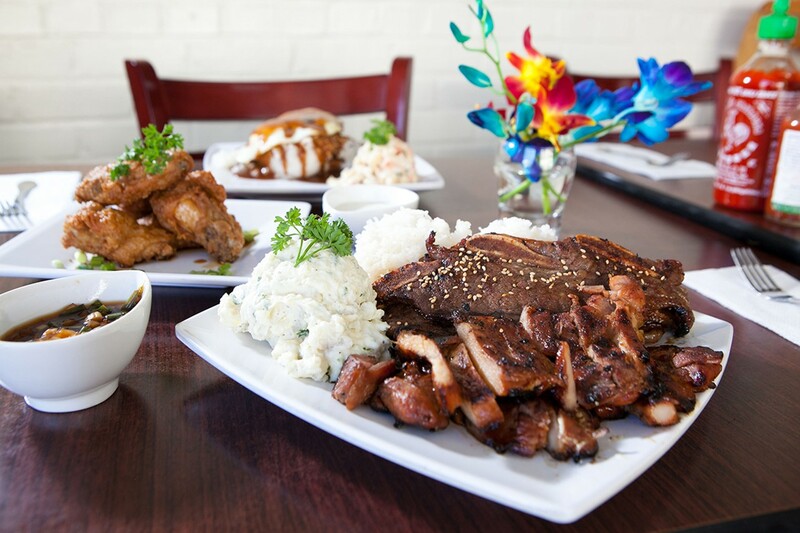 For meats, you can choose one of the traditional options: Hawaiian-style barbecue chicken, barbecued beef sirloin or short ribs, kalua pork (lightly seasoned smoked, pulled-pork), and katsu chicken (breaded, deep-fried chicken cutlet). Aloha Plates range between $12 and $15, but for $18 you can get a combo plate with two meat selections. Of the meats, my favorite was the Hawaiian BBQ chicken, boneless, skinless chicken thighs marinated in a soy-based ginger sesame mixture. Rather than a Southern barbecue sauce, the dish comes with a family recipe that tastes like a hybrid between earthy Korean barbecue sauce and sweet Japanese teriyaki sauce. For an extra punch of flavor, add the special spicy version of the traditionally Chamorro finadene sauce. The shortribs were also a highlight. Tender and thickly cut with the bone left in, they offered the irresistible opportunity to gnaw the gelatinous trimmings left around the bone. But for many Hawaiian ex-pats, the biggest draw on the menu will likely be the "loco moco" — a Hawaiian concoction that consists of a beef patty on a bed of rice topped with a fried egg and covered in gravy. At Kau Kau, those who can handle the richness can order the dish with Spam instead of beef. The rice at the bottom of Kau Kau's version is pleasingly moist and sticky — likely because the restaurant uses medium-grain sushi rice — and the egg is perfectly cooked so that the yolk runs into the thick, savory gravy (a crucial characteristic that you won't find at a chain Hawaiian restaurant like L&L Hawaiian Barbecue). The one qualm that I had with the dish was that my beef patty was slightly overdone, but, luckily, the gravy saved it. The menu also includes numerous "pupus," which refer to family-style appetizers. These include tasty (albeit slightly under-salted) kalua pig sliders with Sriracha aioli served on heavenly King's Hawaiian Rolls. But my favorite item on the entire menu was the fried chicken wings, which come in sweet ginger sesame, spicy buffalo, and lemon pepper. The chicken was perfectly crispy and expertly moist inside, and the lemon pepper seasoning I chose offered an exciting, tangy kick. The Spam musubi, a Hawaiian favorite that consists of fried spam atop a block of sushi rice wrapped with a belt of seaweed, is a difficult delicacy to do wrong. But the Kau Kau version goes above and beyond by adding a special soy-based dipping sauce with generous chunks of ginger that turn the dish into an atypical but tasty experience similar to a French dip. Kau Kau opened about a month ago, and Tina Otenbriet admitted that she and her husband are still training cooks and finalizing the menu. Since opening, they've been trying out different weekend specials, including baby back ribs and poke — a raw tuna salad that's seasoned with a variety of mixtures that often include sesame oil, Hawaiian salt, and fresh seaweed. Poke is often the most sought-after Hawaiian dish for islanders living away from home because it has no adequate culinary counterpart on the mainland, and it's difficult to find due to the high cost of stocking the proper fresh fish. The Othenbriets are now only able to make it every once in a while, but they are currently working on establishing a fish supplier that will allow them to offer it as a consistent weekend special. They also plan to add Hawaiian drink favorites, such as Hawaiian Sun canned juices, and desserts, such as haupia (a traditional coconut custard), as they nestle into their new spot. Tina Otenbriet stressed that they serve food at Kau Kau as if they are serving family, and they are more than happy to take suggestions from customers because they're still in the process of perfecting. As of now, not all the food is exquisitely executed — primarily, the salads were unremarkable and under-salted, and some of the meats were disappointingly dry. But the potential — and the homey charm — are there. For East Bay foodies who are dreaming of a Hawaiian getaway but can't afford a flight across the Pacific, the Kau Kau Corner dining experience will definitely be worth a trip to Alameda.